Each Centennial Edition comes with a Certificate of Authenticity signed by Ford Canada CEO Mark Buzzell, Toronto Maple Leafs' President Brendan Shanahan and Leafs' head coach Mike Babcock. Ford Motor Company of Canada and the Toronto Maple Leafs have collaborated on a commemorative truck that connects the two brands. The 2017 Toronto Maple Leafs’ Centennial Edition F-150 XLT Supercrew, limited to 400, became available in mid-August only at Toronto-area Ford dealerships. Scott Kuzma, Marketing Manager, Eastern Market Area, Ford of Canada, said the concept was based on a package that the Dallas Ford Dealers did with the Dallas Cowboys last year, a limited-edition run of 400 trucks. That concept tied in to the opening of the Ford Center at The Star, the Cowboys’ practice facility in Frisco, Texas, and the beginning of a new Cowboys’ season, he told Automotive News Canada. Texas is the United States’ largest truck market and the Ford F-Series is the best-selling truck in Texas. Both companies partnered on a limited-edition F-150 in 1994. “They created an exclusive F-150 truck (last year) that celebrated a partnership between Ford and the team,” Kuzma said. “The Toronto Area Ford Dealers Association were looking for a way to celebrate the long-lasting partnership between Ford and the Toronto Maple Leafs in the Greater Toronto Area. The Ford F-Series has been Canada’s best-selling truck for 51 consecutive years and the limited-edition 2017 Toronto Maple Leafs Centennial Edition F150 XLT SuperCrew features: Toronto Maple Leafs Centennial Edition badges on the tailgate and front side panels; Oxford White paint with blue and white tailgate panel striping; Toronto Maple Leafs Centennial Edition trailer hitch; Laser-etched chrome foot plates for front doors; Toronto Maple Leafs logo stitched in front and rear floor mats; Centennial Edition badge on center console. Each Centennial Edition comes with a Certificate of Authenticity signed by Buzzell, Toronto Maple Leafs’ President Brendan Shanahan and Leafs’ head coach Mike Babcock. Additionally, $100 from the sale of each Centennial Edition will be donated to Maple Leafs Sports and Entertainment (MLSE) Foundation. 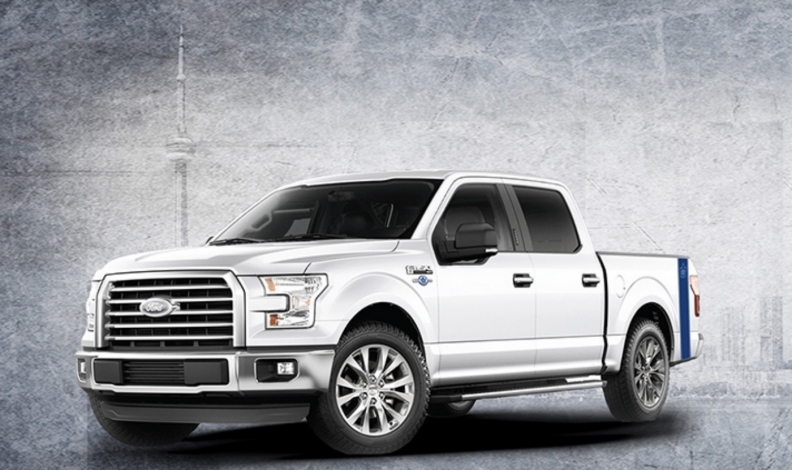 “We think Maple Leafs fans and F-Series loyalists will love this very exclusive truck that celebrates the long-standing partnership between two Canadian icons,” said Mark Buzzell, president and CEO, Ford of Canada.